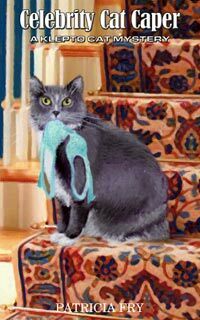 Rags, the kleptomaniac cat, opens up a whole new bag of tricks, when he becomes a therapy cat in a children's reading program. A documentary film crew arrives to capture the cat in action and they get more than they bargained for. Find out how Rags handles his sudden celebrity status. In this story, Savannah and Michael Ivey invite strangers into their home during a torrential rainstorm and learn that one of them has a sinister past. Someone is murdered, Savannah is stalked, Michael's life is threatened, and Rags helps to uncover an old mystery that, until now, has everyone baffled. The Iveys' baby Lily is three-and-a-half-months old and, along with nine-year-old Adam, provides some sweet and warm moments throughout this fast-moving story with many twists and turns. Celebrity Cat Caper is available now for Kindle at only $2.99 at Amazon. Celebrity Cat Caper is also available now in Paperback at Amezon. Paperback version is also available on this website.